$40k for a marble? Have you lost your you-know-what? Carly Andrulat (right) of South Windsor, Conn., enjoyed the Northeast Marble Meet with her cousin, Maggie, and mother, Annette. MARLBOROUGH — Bert Cohen’s passion is marbles, and after decades of collecting the glass orbs, he knows when a bad joke is coming. He almost always beats the would-be comedians to the punchline. “You know, I lose my marbles every day,” said Cohen, 83, of Wayland. But for Cohen, and committed collectors like him, marbles are no joke, but rather a serious enterprise that can generate thousands, maybe tens of thousands of dollars, during a single weekend at a trade show. 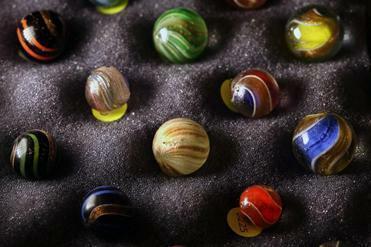 The rarest marbles have sold for as much as $40,000. 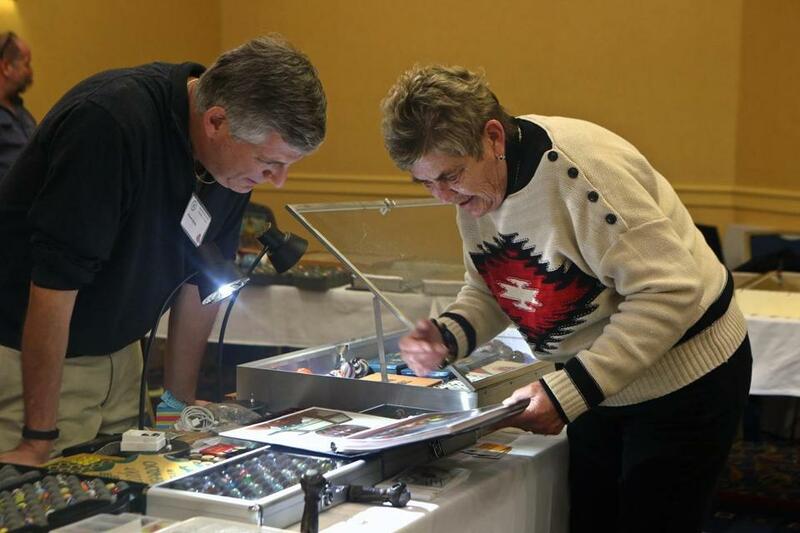 The business and fun of marbles were recently on display at the Marriott Courtyard in Marlborough, which earlier this month hosted the Northeast Marble Meet, one of the nation’s oldest and largest gatherings of people who are mad for marbles. The annual event, which began some 35 years ago, attracted hundreds of marble aficionados and more than 30 dealer-collectors such as Cohen, whose collection numbers in the hundreds of thousands. Yesterday’s toys have become high-priced treasures for modern collectors. Marbles are generally viewed as a children’s pursuit, and one from a bygone, preelectronic era. Kids drew circles in the dirt and risked their marbles in games of “keepsies” that required steady aim, an agile thumb, and a lucky “shooter” to knock marbles from the circle and ultimately into the bags of the winners. Undoubtedly, many a collector got started this way. Collectors are still playing “keepsies” but for much higher stakes. 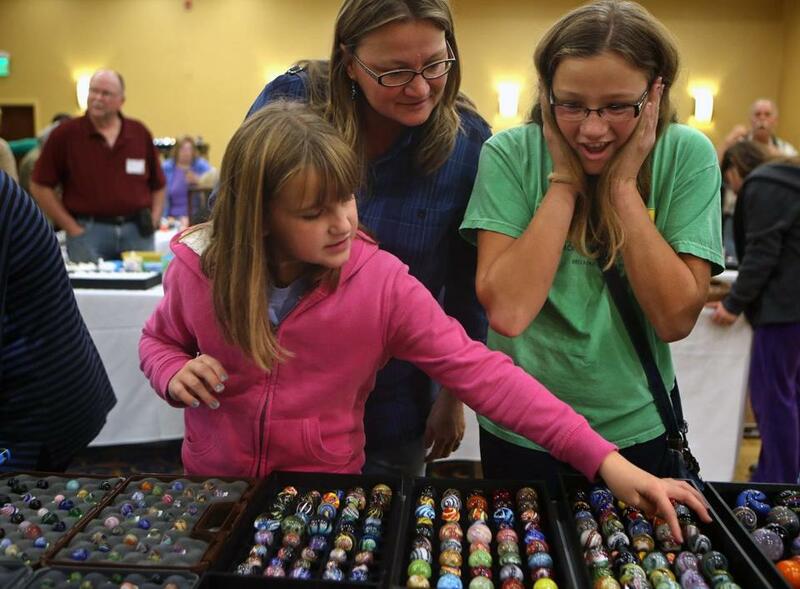 One dealer at the Marble Meet sold a set of 100 “sparkler” marbles for $3,750. Sparklers have strands of different colors running from top to bottom. Elliot Pincus, a Pennsylvania antiques dealer, showed off a ceramic “Pennsylvania Dutch Marble,” dating to the 1840s. Estimated value: $1,000. He also displayed a “Single Pontil Lutz,” a glass marble made in Germany about 125 years ago. The marble, with reflective copper colors, is estimated to be worth in “the five figures,” said Pincus, who declined to give an exact amount. Specifically, dealers and collectors covet the rare marble that might have beautiful swirls of colors in them, or just accidental mistakes by manufacturers that turn a mass-produced object into one — or just a few — of a kind. Marbles come in all sizes: three-eighths of an inch “pee wees,” three-quarters of an inch “shooters,” or sometimes hand-made decorative marbles an inch or more in diameter. Marbles are usually made of glass, but they can also be made of wood, ceramic, clay, stone, and hollow-steel. Some may have sketches of comic-book characters embedded in them, such as Superman or Popeye, while others have company logos in them — or renderings of animals, pastoral scenes, and other motifs that catch the eye. Lawrence E. Alley III showed off something that most marble collectors would love to possess: a complete 1933 “salesman’s sample case” of the Alley Agate Co., a marble manufacturer. The sample set, which contains 150 marbles of various patterns and colors, was used by Alley Agate salesmen to pitch marble products to retail customers and distributors. Alley’s grandfather, Lawrence Alley Sr., owned Alley Agate until 1949, when he sold it. The company was renamed Marble King Inc.
Alley, a Marlborough resident and retired engineer, declined to estimate the value of his set. But he is not selling anyway. Not ever. “My son would kill me if I sold it,” said Alley, 75, while laughing. The company also produces collectible marbles, with prices for custom-made pieces running from $15 to $25 each. Marble King of Paden City, W.Va., is one of the last American marble manufacturers. Its owner, Beri Fox, said her toughest competition comes from Chinese manufacturers who can employ low-paid workers. Mexico’s Vacor de Mexico is also a major manufacturer of marbles. “But we’re hanging in there,” said Fox, whose 28-employee company sponsors the annual National Marbles Tournament in Wildwood, N.J., where dozens of children gather to compete in old-fashioned marble games. Robert Block, a Connecticut resident who has written numerous books on marbles and marble collecting, said the hey-day of American marble manufacturing was in the 1920s and early ’30s, when marbles were hugely popular among children. The advent of television, video games, organized youth sports, and other social changes have hurt both the casual and sometimes serious sport of marbles, he said. Internet commerce, especially eBay, has also hurt marble shows and auctions, as collectors increasingly display and sell products online. But collecting is still strong, said Block, who next year will become the lead organizer of Northeast Marble Meet. Block said he owns about 50,000 collectible marbles. Nancy Zeloski (right) of Moultonborough, N.H., showed Robert Block of Connecticut photos of her marble collection.